We do not currently provide a log or history of all trades posted for all helpers, but you can see a list of trade details in two places - for each helper in their "Recent Trade History" (below), or for each shift using the "Shift History". These show the trade details for the last 45 days. 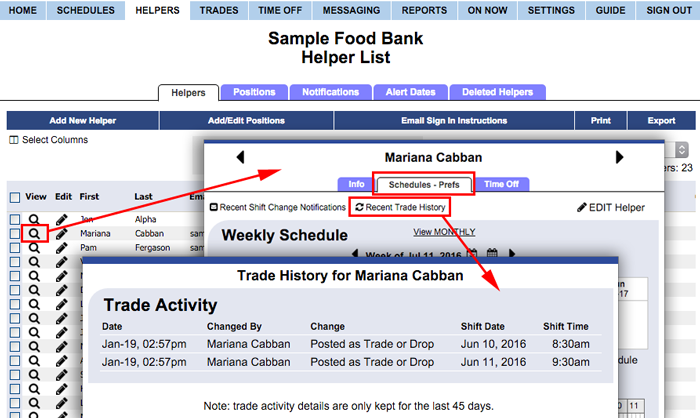 In the top menu, hover over HELPERS and choose "List"
You can find the trade details for a particular shift for the last 45 days by clicking that shift in the schedule and then clicking the "Shift History" link.